Zhu et al. (2014) aim to enhance the science on properly setting and forecasting carbon prices. To do so they examine the European Union Emissions Trading Scheme (EU ETS) through empirical mode decomposition to better understand the formation mechanism of carbon prices. The EU ETS is the largest carbon market in the world, covering 12,000 installations and 25 countries. Over the past few years there have been a number of studies analyzing carbon prices in the EU ETS, that have generally fallen into one of two categories; structured models and data-driven models. Structured models analyze carbon price movement through the perspective of supply and demand and can help with understanding the generation of carbon prices. However, because of the unstable nature of the market, these models have been difficult to implement. Data-driven models, such as linear regressions, work well for short-term forecasting but fail to explain the driving forces behind carbon price changes.To avoid these limitations, Zhu et al. use Empirical Mode Decomposition (EMD) in their analysis. EMD is a data analysis approach for nonlinear and non-stationary time series that can decompose carbon prices into one residue function and several independent intrinsic mode functions (IMF). In this analysis Zhu et al. produce eight IMFs. Each of these is based on local characteristic scales and can be analyzed to better understand the characteristics of the carbon price and the underlying factors influencing that carbon price. After decomposition, the resulting IMFs and residue are reconstructed into a high frequency component, a low frequency component and a trend component. Economically speaking, the high frequency component is interpreted as short term fluctuations, the low frequency component is interpreted as significant trend breaks, and the trend is interpreted as the long term economic trend. Analysis of the trend line shows the evolution of the carbon price in the long term. The low frequency component (significant trend breaks) can explain sharp ups and downs in the carbon price, such as jumps associated with changes in government policies. Finally the short term, high frequency component mostly describes normal market operations that drive market fluctuations. These three components of price can then be forecasted into the future and combined to produce future projections of carbon prices. Zhu, B., Wang, P., Chevallier, J., & Wei, Y., 2014. 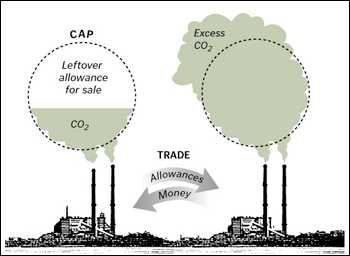 Carbon price analysis using empirical mode decomposition. Computational Economics, 1-12. This entry was posted in Carbon Capture, Makari Krause, Regulation and tagged Bangzhu Zhu, Carbon Price, Carbon Trading, EU Emissions Trading Scheme, Julien Chevallier, Ping Wang, Social Cost of Carbon, Yiming Wei by Emil Morhardt. Bookmark the permalink.